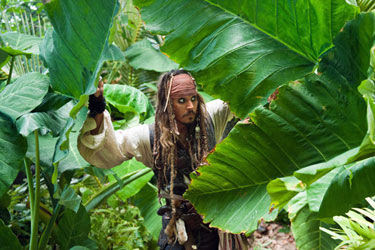 Captain Jack Sparrow (Johnny Depp) in the middle of nowhere in search of fool's gold in "Pirates of the Caribbean: On Stranger Tides." Photos courtesy of Walt Disney Pictures/Jerry Bruckheimer Films. “THE Foundation of Youth. What does it require,” Captain Jack Sparrow inquires. “A mermaid, Jack,” his seductive former lover/current nemesis, Angelica answers. Ands so it goes in “Pirates of the Caribbean: On Stranger Tides,” the fourth installment of the Johnny Depp (Sparrow)/Jerry Buckheimer/Disney Pictures franchise. The film opens nationwide today. 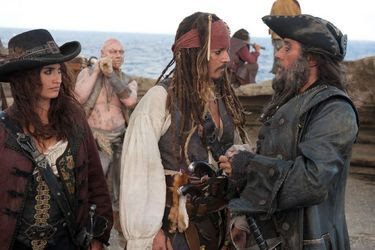 Angelica (Penelope Cruz), Captain Jack (Johnny Depp) and Blackbeard (Ian McShane) have a meeting of the minds in "Pirates of the Caribbean: On Stranger Tides." On this voyage into the treacherous and unknown, Governor Weatherby Swann (Jonathan Pryce), his daughter, Elizabeth (Keira Knightley), Will Turner (Orlando Bloom) and Davy Jones (Bill Nighy) remained ashore. Gone, too, is the director of the three previous "Pirates," Gore Verbinski. In the director's chair for the bleaker "On Stranger Tides" is Rob Marshall. 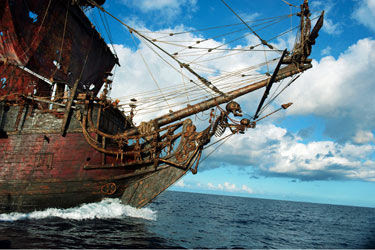 Disney has plans for at least two more of the films based on its theme park ride, Pirates of the Caribbean. It will be interesting to learn who will sign up for the subsequent voyages. Will JD have grown weary of the swashbuckling Jack and turn down obscene amounts of money to slink and slur as no other can? Will he be considered a little long in the tooth in the coming years, only to be replaced by a younger body a la the James Bond character in filmdom’s most enduring franchise? When the time comes, without doubt, tongues will be awagging with a treasure trove of speculation, conjecture, outright lies and gross exaggeration. "Queen Anne’s Revenge" is Blackbeard's (Ian McShane) favorite mode of transportation in "Pirates of the Caribbean: On Stranger Tides." As with most film franchises – and "Pirates" is no exception – it is pointless to review them. They are so familiar; the characters are like family. One looks forward to seeing them every other year or so, regardless of their behavior. Should the reunion not be a happy one … oh, well … one thanks his lucky stars that it is short-lived. Captains Barbossa and Sparrow are ... er ... tied down at the moment in "Pirates of the Caribbean: On Stranger Tides." The most lucrative film in the “Pirates” fanchise was the last, “At World’s End.” So far, the 2007 vehicle has grossed more than $2.5 billion with a “B” worldwide. It rather goes without saying then, does it not, that “Pirates of the Caribbean: On Stranger Tides,” too, will rake in booty aplenty at several thousand domestic theaters this weekend and beyond on various other platforms here and abroad? “Pirates of the Caribbean: On Stranger Tides” is Rated PG-13 for intense sequences of action/adventure violence, some frightening images, sensuality and innuendo.